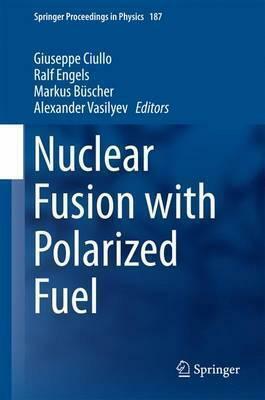 This book offers a detailed examination of the latest work on the potential of polarized fuel to realize the vision of energy production by nuclear fusion. It brings together contributions from nuclear physicists and fusion physicists with the aims of fostering exchange of information between the two communities, describing the current status in the field, and examining new ideas and projects under development. It is evident that polarized fuel can offer huge improvements for the first generation of fusion reactors and open new technological possibilities for future generations, including neutron lean reactors, which could be the most popular and sustainable energy production option to avoid environmental problems. Nevertheless, many questions must be resolved before polarized fuel can be used for energy production in the different reactor types. Readers will find this book to be a stimulating source of information on the key issues. It is based on contributions from leading scientists delivered at the meetings "Nuclear Fusion with Polarized Nucleons" (Trento, November 2013) and "PolFusion" (Ferrara, July 2015). Illustrations note 14 Tables, color; 14 Illustrations, color; 34 Illustrations, black and white; XIV, 154 p. 48 illus., 14 illus. in color. Giuseppe Ciullo is a Professor at the Department of Physics and Earth Sciences, Ferrara University, Italy. He previously undertook a fellowship at the national laboratory LNL-INFN (1994-96) and was a researcher at CeFSA - CNR (1996-2000). His recent interests include polarized nuclear targets and their use in fundamental nuclear physics in different experimental collaborations: HERMES, OLYMPUS, PAX, JEDI TRIC, and PolFusion. Ralf Engels has been a scientific staff member of the Institute for Nuclear Physics (IKP), Research Center Julich, Germany, since 2006. He obtained his PhD from the University of Cologne in 2002 before working as a postdoc at IKP. His interests are polarized targets, ion sources, and polarimeters for experiments at accelerators. In parallel, he is using a Lamb-shift polarimeter for atomic and molecular physics. He is a member of ANKE, WASA, PAX, JEDI, BOB, and the PolFusion collaboration. Markus Buscher is a Professor at the Institute for Laser and Plasma Physics, Heinrich Heine University, Dusseldorf, Germany and a staff member at the Peter-Grunberg Institut (PGI-6), Research Center Julich, Germany. His recent research activity has included experiments on laser-induced particle acceleration and experiments with the WASA spectrometer at COSY. He is a member of the ANKE/COSY, PANDA/HESR, and WASA-at-COSY collaborations. Alexander Vasilyev is Head of the Cryogenic and Superconductive Technique Laboratory of the National Research Center "Kurchatov Institute" Petersburg Nuclear Physics Institute, Russia. He is also Deputy Head of the High-Energy Physics Department at the Institute. His interests are polarized gas targets, cryogenic targets, ions, and atomic beams. He is a spokesperson for the MuSun collaboration (PSI, Switzerland) and a member of the PolFusion collaboration.